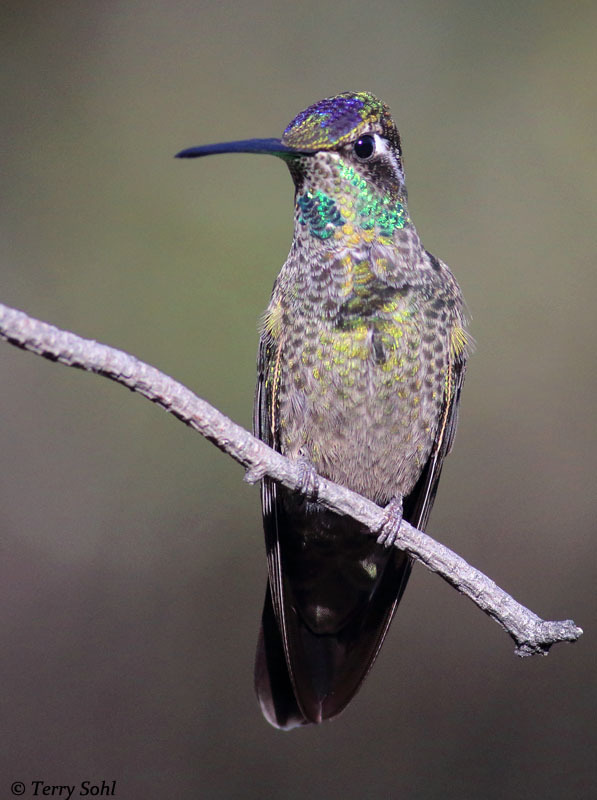 Rivoli's Hummingbirds were formerly known as "Magnificent Hummingbird" until 2017, when the American Ornithological Union split the species into Rivoli's Hummingbird (the one found in the southwestern United States and southward through Nicaragua), and the "Talamanca Hummingbird", found in Costa Rica and Panama. Rivoli's Hummingbirds are one of the largest hummingbirds, dwarfing the hummingbird species that are normally found in South Dakota. 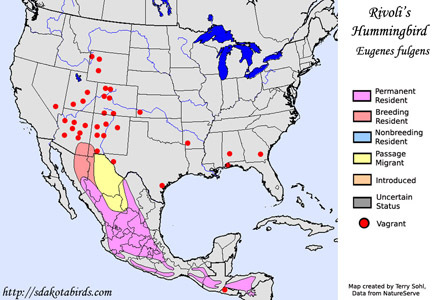 Rivoli's Hummingbirds are not normally found in South Dakota, with their normal range barely crossing the U.S./Mexican border in southern Arizona. However, individuals have been known to wander widely, and they have been found in many other U.S. states. A male is pictured in the photo to the right. 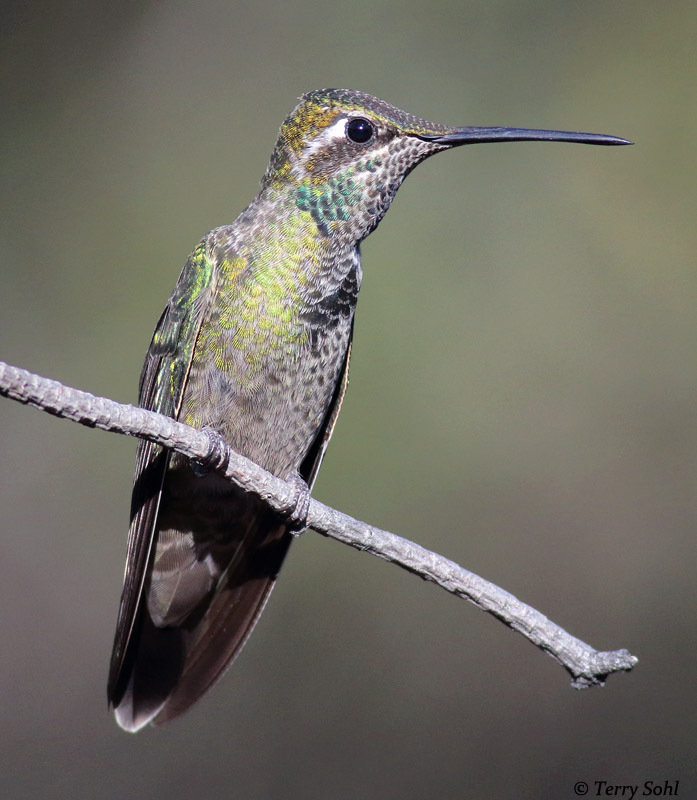 In normal range, Rivoli's Hummingbirds are found in forested mountain settings, most often in shady canyons of deciduous or mixed-deciduous forests, or higher elevation conifer forests. Feeds heavily on nectar as do most hummingbirds. 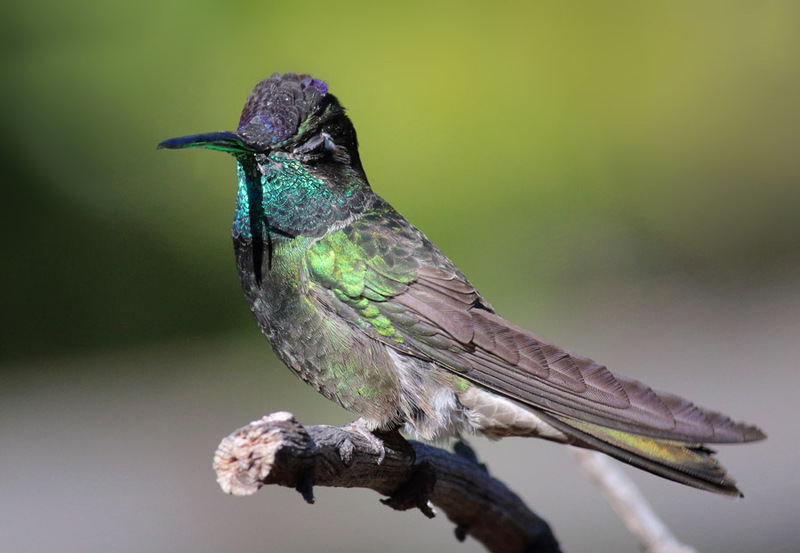 However, Rivoli's Hummingbirds may be more insectivorous than other hummingbirds, as they are also often seen feeding on small insects and spiders. 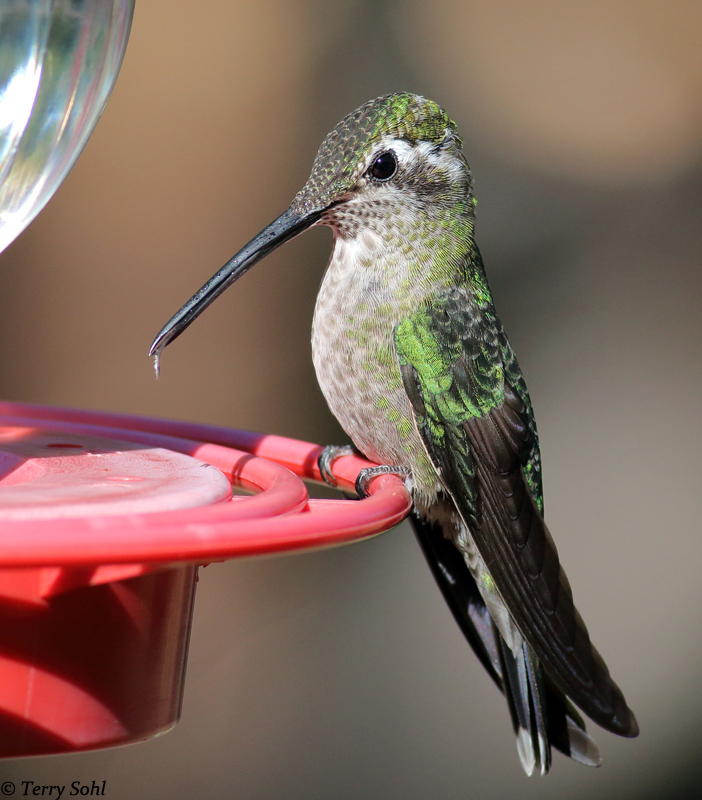 Feeds in typical hummingbird fashion at flowers and other nectar sources. Will also glean insects from foliage or branches and tree trunks, and has often been seen plucking insects from spider webs. Non-breeder in South Dakota. 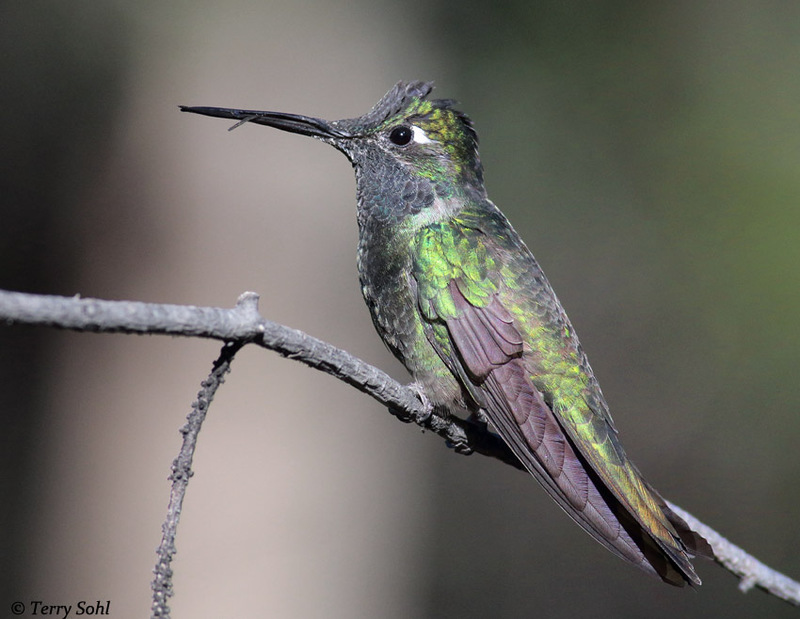 On their normal breeding grounds, Rivoli's Hummingbirds build a small cup nest constructed of bits of bark, mosses, lichens and other material, bound together with spider webs, and lined with mosses and soft down. The nest is placed in the fork of a tree branch or along a horizontal tree branch, between 6 and 30 feet from the ground. The female lays 2 eggs and she alone incubates them. The young hatch after about 17 days. The most commonly heard vocalization is a sharp chip call given in flight. Also has a series of varied calls given during breeding season or while chasing rivals from territory. 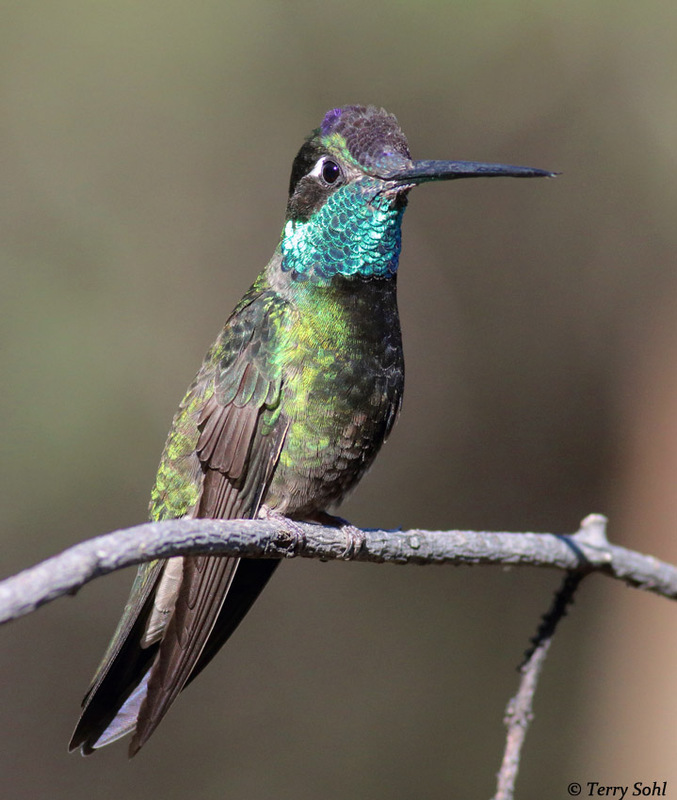 1Click here to hear the chip calls of a Rivoli's Hummingbird, recorded in Jalisco, Mexico. 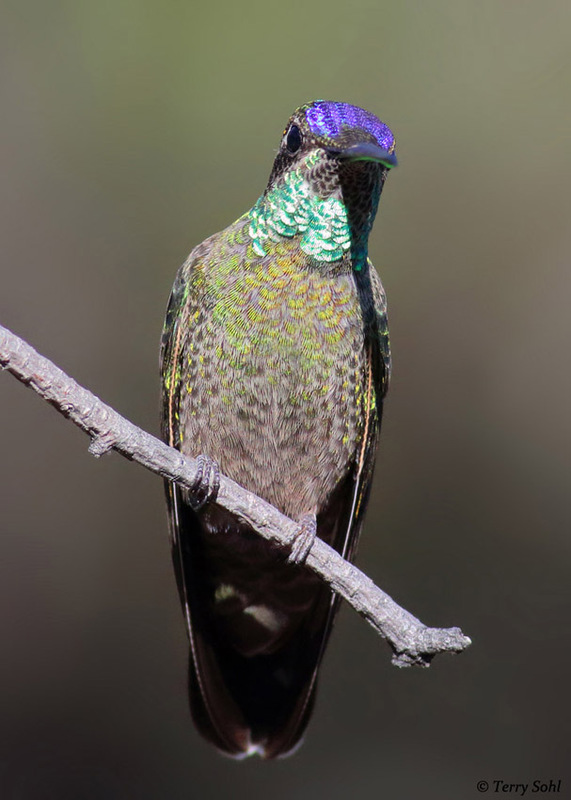 2Click here to hear the soft rattling calls of a male Rivoli's Hummingbird, recorded in Portal Arizona (note other bird vocalizations can be heard at the start of the recording and elsewhere). The mountains and mountain valleys on the Arizona/New Mexico border with Mexico represent the northern edge of the breeding range. Most of these birds move southward in the fall, but most birds in their breeding range in Mexico and Central America are full-time residents. 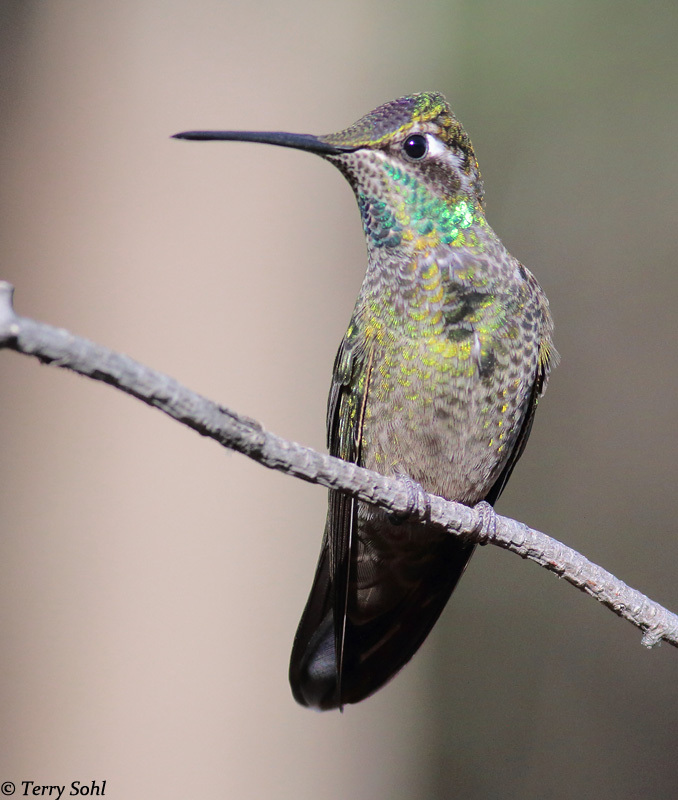 Rivoli's Hummingbirds are rather unique in appearance, although of course are similar to the Talamanca Hummingbird (the other species the former aggregate title of "Magnificent Hummingbird" was applied to. However there may be some confusion with the following species. Blue-throated Hummingbird - A large hummingbird with a similar structure to a Rivoli's Hummingbird, they may appear similar in poor light. 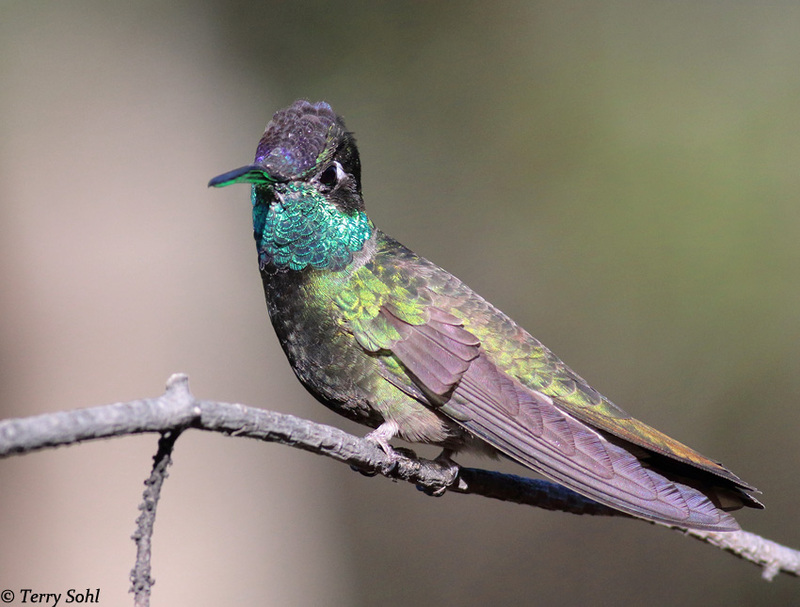 However in good light when the iridescence of the males shows up, male Blue-throated Hummingbirds are much less brilliantly colored overall, with a light dingy gray belly as opposed to the colorful underparts of a male Rivoli's. 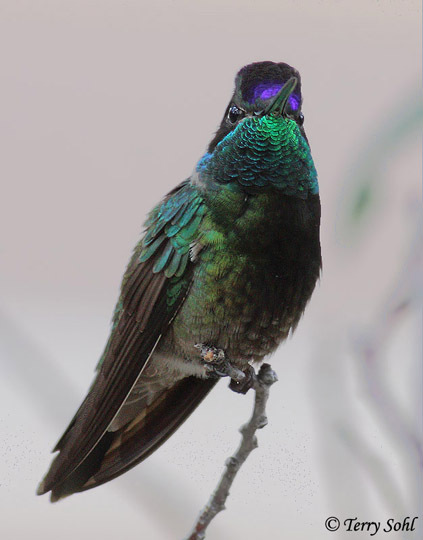 Blue-throated Hummingbirds also have a white line behind the eye and another near the bill, while Rivoli's have just a white dot behind the eye. 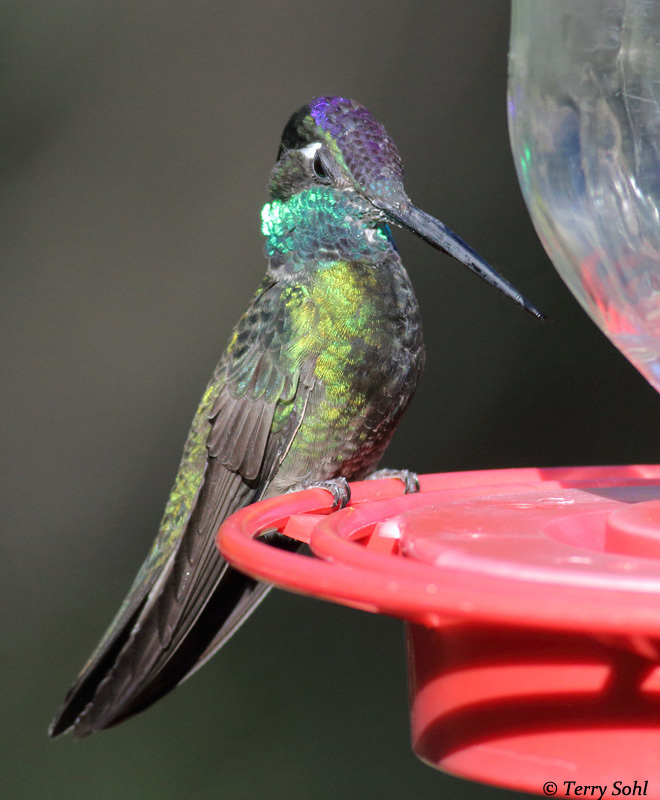 Rivoli's males have a brilliantly colored crown while the Blue-throated Hummingbird is much more subdued. 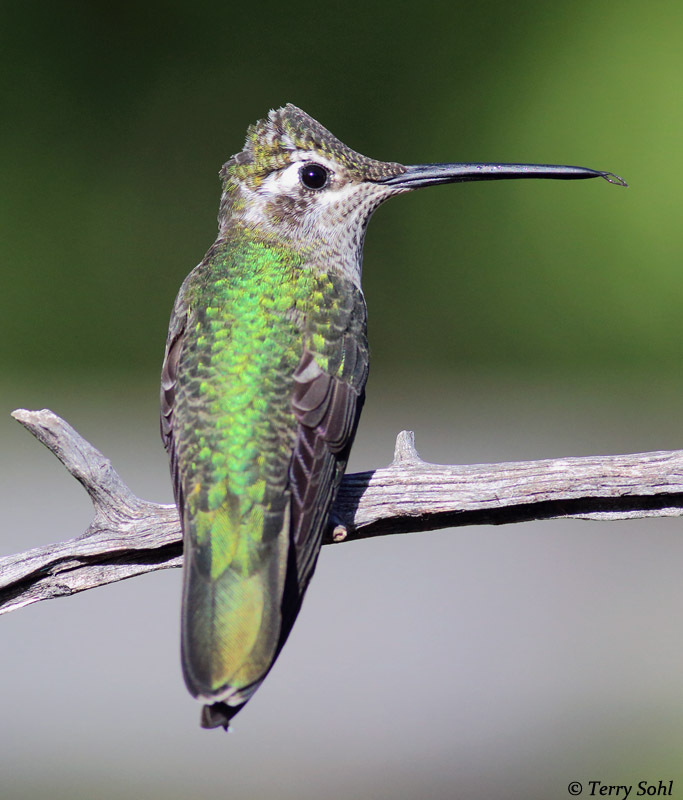 Females and juveniles of Blue-throated Hummingbirds are similar in appearance to female and juvenile Rivoli's Hummingbirds and even tend to share the same two white facial stripes, but they have a bronze color on their lower back and rump, while Rivoli's are more greenish. Populations appear to be or increasing, with noted increases in parts of the southwestern United States in recent decades. They are found over a broad geographic area and are quite common in parts of their range. The IUCN considers the Rivoli's Hummingbird to be a species of "Least Concern". Click on the image chips or text links below for additional, higher-resolution Rivoli's Hummingbird photos. South Dakota Status: Accidental visitor to South Dakota.